[ Editor’s Note: The Mufti was the real deal, and no he didn’t fool us. People at his level are not difficult to learn about when they are public and accessible…sort of, in his case. Because he was a “multi-faith” Muslim, he was hated by the Wahhabis and placed under a death sentence, so he had heavy security, the kind you need when you are a truck-bomb target. He has huge support in Syria for his passionate advocacy for saving the Syrian people from the terror war inflicted on it by the West, Israel, the Gulf States, and even Turkey. They are all in the game to get a piece a Balkanized Syria, or what was left of it. Turkey got a head start, by stripping Aleppo clean of all its industry and trucked over the border for sale at special prices, I am sure, to the Erdogan party faithful. We have just bare bones news on the attack today, and will be updating as we learn more. Russia could be on the spot here, if it was a drone killing, and if they do not release the details of their radar and satellite tracking. Nothing flies over Syria that both Moscow and NATO don’t see and know where it took off from and returned. Being tired from doing this work is normal, because it is endless. If this were a retribution killing — a response to the progress of the Astana talks and with the Geneva ones around the corner, an attempt to poison the peace effort by killing the Mufti’s family — then that would be very disappointing. Our condolences go out to the Mufti, but we cannot say to his immediate family also, because he doesn’t have one anymore. But Syria has always been his family. When the Takfiris started targeting the Christian churches, to show solidarity with them and to refute the fomenting of a religious war, he sent his imams out to hold prayer vigils in Christian churches. This of course put them all on death lists, too. The Mufti is the kind of man who can ask people to do this, and they will. This conflicts 180-degrees with the propaganda image the Israelis have tried to tar him with. Many Syrians have lost families in this proxy war against Syria. The Mufti now shares their pain more than he ever expected to. Grand Mufti of Syria, Ahmad Bader Hassoun, said Turkish warplanes killed 18 members of his family in, wives, children and the even his father. 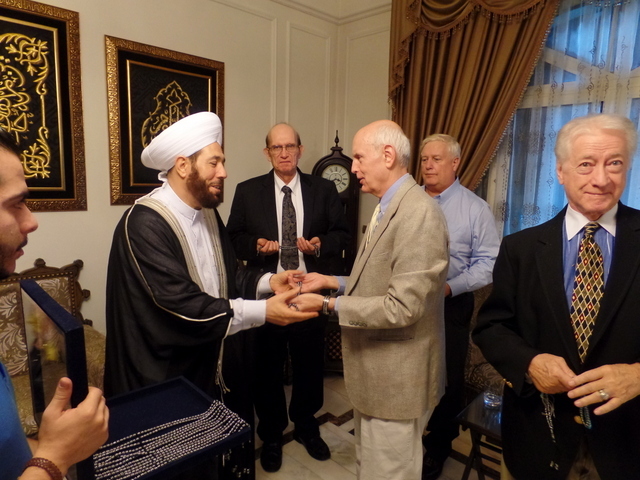 Two weeks ago, Human Rights Watch accused Ahmad Bader Hassoun, the Grand Mufti of Syria and primary defending of Christian communities throughout the Middle East of personally ordering the hanging of 30,000 prisoners being held at a single prison outside Damascus. Now it is revealed that the Human Rights Watch accusations were based on fake reports, and when this ploy failed, another one materialized, this one requiring White House approval for a targeted assassination attack on the family of a religious leader, a new all-time low, even for the United States. 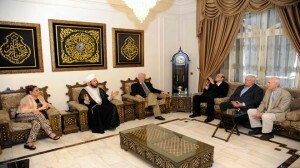 Two weeks later, in what is a suspected US drone attack, held during Turkish raids in the region, the family compound of the Hassoun clan was obliterated, with 18 dead, in what has to be characterized as a targeted terror attack on Syria’s most beloved cleric and a known enemy of Israel and Turkey for his criticism of their persecution of Christians. Next articleResearch Question: Why do more conservatives support Israel? We, us the human, we kill them all don’t we. Earlier today before reading this sad news I had listened to an old Dr. M. L. King speech about the power of non violent protest. He said something akin to; one must have a cause worth dying for, or life is not worth living. Down through the ages it has been the same. Those who murder our most sincere leaders soon rename Boulevards, buildings, and airports in their name, as if this is some kind of joke. I listened to the Mufti interview with Press TV posted herein, and was struck by the calm, almost smiling features of his face as he talked of forgiveness. He mentioned the distorted, twisted false narratives repeated by the Western media ad nauseum for the past 15 years, or more. Yes, we now have his blood on our hands too. How much longer will Americans “for” peace remain silent? It can not be too much longer. Where does the blame lay if not within us? It breeds, and grows rotten in our silence. 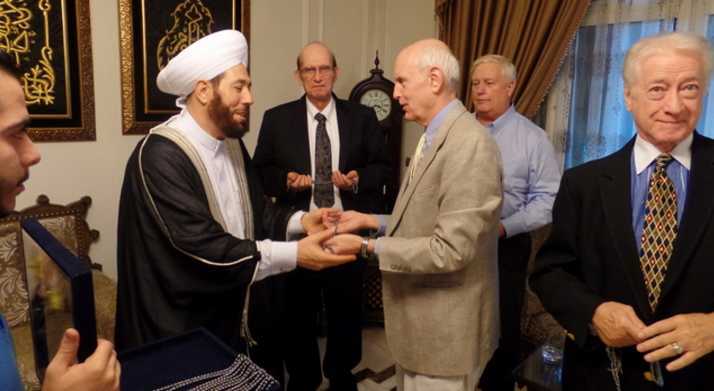 The Grand Mufti appears to have been the “real deal”. this is an odd, and an evil world where the truth will get you killed. It is marked by the human. We are the mark of the beast. On behalf of the people of America (and the world), please accept my/our condolences on your great loss. *IF* our new U.S. president ordered U.S. soldiers to direct a U.S. drone to kill your family, I am ashamed – as would be most if not all American people. 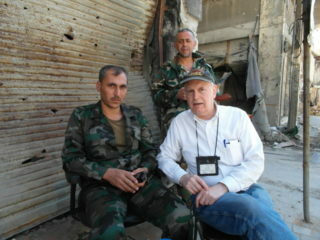 While in Syria as an observer with Veterans Today, you and I met three (3) times – once semi-formally, as per Jim Dean’s pictures above. At our semi-formal meeting and afterwards, I invited you to come to America. Others and I still intend to make it happen. Although more than appropriate, we cannot offer you a speaking engagement before the U.S. Congress (as Israeli Prime Minister Bibi Netanyahu was offered and accepted). What you told VT editors, others and me at our Damascus meeting is that the chief Rabbi of Syria asked you to protect his Jewish Synagogue while he was away. You agreed to do so, and you did it (i.e., no violence at his Synagogue while he was away from Syria). You are a gem – a good representative of the Syrian people, who are also “Diamonds in the Rough.” For no reason whatsoever (except for wrong reasons), U.S. leaders have chosen to target Syria, which is far from perfect, as Veterans Today editors, others, you and I well know. Veterans Today and I intend to correct the perfidy that has controlled our nations for far too long. نيابة عن الشعب الأمريكي (والعالم)، أرجو أن تتقبلوا / تعازينا في المصاب الجلل الخاص بك. * إذا * أمر الرئيس الأمريكي الجديد جنودنا الولايات المتحدة لتوجيه طائرة بدون طيار امريكية لقتل عائلتك، وأنا أشعر بالخجل – حيث ستكون معظم إن لم يكن كل الشعب الأمريكي. بينما في سوريا بصفة مراقب مع قدامى المحاربين في اليوم، أنت وأنا اجتمع ثلاث (3) مرات – مرة واحدة شبه رسمية، وفقا للصور جيم دين أعلاه. في اجتماعنا شبه الرسمي وبعد ذلك، دعوت لك أن تأتي إلى أمريكا. الآخرين، وأنا لا تزال تنوي تحقيق ذلك. على الرغم من أن أكثر من مناسبة، لا يمكننا أن نقدم لكم اشتباك يتحدث أمام الكونغرس الأمريكي (كما عرض رئيس الوزراء الإسرائيلي بنيامين نتنياهو ومقبولة). ما قلت المحررين VT، والبعض الآخر ولي في اجتماع دمشق لدينا هو أن الحاخام من سوريا يطلب منك لحماية له كنيس يهودي بينما كان بعيدا. التي وافقت على القيام بذلك، ويمكنك فعل ذلك (أي أي عنف في بلدة كنيس في حين انه كان بعيدا عن سوريا). كنت الأحجار الكريمة – ممثل جيد للشعب السوري، الذين هم أيضا “الماس الخام في.” لأي سبب على الإطلاق (إلا لأسباب خاطئة)، وقد اختار قادة الولايات المتحدة لاستهداف سوريا، والتي هي بعيدة كل البعد عن الكمال، والمحاربين القدامى المحررين اليوم، والبعض الآخر، أنت وأنا نعرف جيدا. قدامى المحاربين أنا اليوم وتنوي تصحيح الغدر التي تسيطر عليها دولنا لفترة طويلة جدا. The time has come that we stop commenting and start acting. We, ALL people of the world, of ALL religions and political persuasions should stand up and shout ENOUGH! We should ALL unite, and make a pact for peace. The greed machine has to be put to a stop! The war machine has to be put to a stop! The easiest thing we can do, is boycott ALL products from the countries participating in this criminal madness. Deal in CASH, as it will withdraw more money from the criminal bank which are a huge part of this problem. Create ideas, spread the word, reach out and unite! WE HAVE TO PUT A STOP TO THIS BEFORE IT DESTROYS US ALL!! Well said & a good place to start. The world would be an amazing place if the UN had a council of people who displayed the wisdom humanity and spirituality of the grand Mufti of Syria, Ahmad Bader Hassoun. Once again thx VT for posting this. Why would anyone want to kill the family of the most beloved religious figure? Because they can. This is the disgusting strategy Trump proposed. This has the smell of amateur idiocy and cowardice. Maybe I’m crazy or ill informed, but I can’t see how this serves any purpose whatsoever. Pure stupidity. One does have to wonder why this occurred at all. Russian defense systems could have prevented this. Why does Russia continue to allow cruise missiles and aircraft to violate Syrian airspace? Why does Russia not allow Syrian military to defend their country? Something is not right here. Maybe Russia is indeed playing a double game…opting to merely continue using Syria as a game field and not seriously confronting outside threats until Russian nationals are threatened or harmed. Possibly there IS an understanding between them and the US/Israel. Is it possible that Russia is using Syria as a bargaining chip and not a regional partner. Is it possible Russia is no better than Europe? Well don’t forget how quiet Russia has been on the Israeli strikes against Damascus, hardly a peep. And Russia never officially made a big deal over Jordan, Israel, Turkey or the Gulf States supporting the proxy terror war, as the Gulf States were considered arms exports buyers. 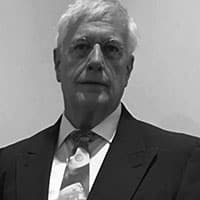 Poppadop…I understand your point, but don’t agree with it. Syria and Ukraine are two different cases. Russia has openly, supposedly, already committed to Syria, militarily and politically. For these attacks to continue unopposed does Russia no good, just as it does Syria no good. Let the Syrians defend themselves. What difference does bad publicity mean when they constantly lied about anyway, are not those reading alt news already aware of the wests deceptions? Not being able to defend themselves only encourages the criminals in Tel Aviv. Has not Russia already issued warnings to the west about attacking troops and possibly retaliated? Has Syria not already warned about violating their airspace? Those that would complain about Syria downing any invader in their own airspace, have no moral ground to stand on, regardless of propaganda value. Russia understands what encouraging a bully leads to, which brings me back to: Why? 4 dead Russian officials dead on foreign grounds in 3 months, coincidences? Russian civilian and military planes dropping from the skies? All possible provocations. Possibly the neobarbarians think as you do…bad publicity=right to attack Russia. They will continue their ‘attacks’ until they get a response, why wait? The only possible answer for me is that Russia has a plan of their own, which requires waiting for the right opportunity or for some sort of weapons system to come on line, if indeed they are being honest. Countries such as Syria, Iran, Russia and at one time, Libya should have sent the western liars a message they would not ignore. Since it seems to be OK with western media to spread lies at the behest of Israeli corrupted governments, turnabout should be fair play. These people take lives, whether they would admit it or not. They are the enablers of the snake pit. Maybe someone should send these cohorts of murder a message they could not ignore. Remove their families from them?…or them from their families? This a short list, but I bet it would get someones attention. James Goldston, Steve Burke, Leslie Moonves, Jeff Zucker, Rupert Murdoch, Mark Zuckerberg. By no means a complete list, but a good place to start. I’m surprised any righteous human is alive in the whole Middle East after the decade of war. And with regards on trying to get the people of any country that is relentlessly bombarded with lie after lie from their governments and media, to accept the truth/facts, is a huge undertaking. Trying to convince someone to see the truth when they have been subjected to years of lies is nearly impossible. Mt hats off to VT and VNN for the reality of the world facts. I have had no luck communicating with my old friends/family with respect of the Truths of Today. I don’t know if US administration is aware of this but the recent US foreign policy episodes in Ukraine and Syria has completely destroyed the image of the western based human rights organizations, HRW, Amnesty and all its sisters, daughters and offshoots. They have become almost next to communist adentures. Future US administrations will have to double or tripple their coercive and corruptive efforts to influence the hearts and minds of upcoming generations European and Arab politicians. It will become literally impossible for US just to take them seriously over simple overseas deals and moreover for the strategic ones. Start peeling away the layers of deception and lies and the truth will be brought forth to light. Ignore the CMMM and the phony Human Rights Watch. Who was behind this outrage? Turkey, Israel, the U.S. or KSA? or all four that plotted and schemed this murderous act. As an American, I am totally ashamed of America. I no longer claim it as my country as it hasn’t been so for many years. In truth I can no longer recognize America. It has become something evil, wicked and immoral. Not to mention distasteful and phony.